SpaceForce Custom Janky & Dunny by KayMay! Time to sign up to the SpaceForce, kids! We’ve been transfixed to the SpaceForce Custom Janky & Dunny series by Colorado based artist, KayMay for some time now and we are sure that you too will also love them! Incredibly, only customising Designer Toys since the turn of 2019, KayMay has hit a solar home-run with these customs! SpaceForce refers to the entire space entity/crew that I’m building this series off of, but these particular characters are called Moon Harvesters. They are tasked with, you betcha, harvesting the many moons of our galaxy to harness their energy. The harvester itself is the body of the dunny while they can and do accidentally cary a myriad of things back to camp such as alternate planets other than the assigned moons and various pieces of space trash (that concept will be explored in the second drop of SpaceForce, however). 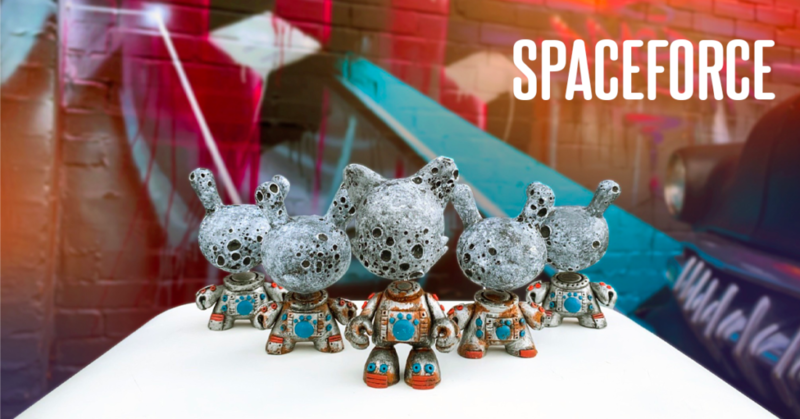 The SpaceForce Custom Dunny are a series of ten, with five already definitely sold with the potential of the other five sold too – KayMay is confirming. These were priced at $65 (about £50) + shipping. The SpaceForce Janky are also a series of ten and are priced at $80 (about £61) + shipping. You should go follow KayMay on Instagram HERE and drop her a DM if you’re interested in purchasing any of the SpaceForce custom series.